In many patients only part of the knee joint is affected by osteoarthritis (destruction of the joint surfaces). The medial (inner) compartment of the knee and the area behind the patella are particularly susceptible to cartilage wear. This is often the case in patients with more severe bow-leg deformity (varus knee). For such patients, a partial knee replacement is better than a total knee prosthesis: the healthy parts of the bone and cartilage are preserved and only the damaged parts of the knee joint are replaced. A Repicci prosthesis is a partial knee replacement developed by U.S. orthopaedist Dr John Repicci. Since it only treats one of the two condyles (rounded prominence) of the femur, it is also referred to as a “unicondylar” knee replacement. On the femur side, it consists of a metal inlay which forms an artificial joint together with the polyethylene part on the tibial side. Due to this design, a Repicci prosthesis is also referred to "sledge prosthesis". Patients who undergo this minimally invasive knee surgery can usually put their full weight on the knee again one day after the procedure - or even sooner. With this gentle surgery of partial knee prosthesis, the movement control and coordination of the knee feels natural. Since this preserves most of the healthy part of the knee, it is typically more comfortable than a total knee replacement (total endoprosthesis). This often even makes it possible to return to playing sport regularly after knee surgery. Who is a Repicci partial knee replacement suitable for? Which doctors specialise in Repicci prostheses? What is the success rate of a Repicci prosthesis for osteoarthritis of the knee? Preparation: what happens prior to the knee surgery? What is the procedure for a Repicci prosthesis? Which type of anaesthesia is suitable for Repicci prosthesis surgery? Should I expect pain after the knee surgery? What will my stay be like at the Gelenk-Klinik Hospital? What do I need to keep in mind after surgery? What is the cost of a Repicci partial knee replacement? Is a Repicci prosthesis an option for me? How can international patients schedule a partial knee replacement? A Repicci prosthesis enables the targeted treatment of cartilage damage in the knee whilst preserving the joint. You can put your full weight on the knee immediately after the Repicci prosthesis has been implanted. As a result, this procedure is particularly beneficial for younger patients actively engaged in sports compared to a full knee replacement. A large portion of the natural knee joint is preserved (about 80%) with a Repicci knee prosthesis. Pathologies which can be successfully treated with a Repicci prosthesis include Ahlback disease (osteonecrosis of the knee), gonarthrosis (worn cartilage in the knee) or osteochondral lesions (damage to the bone beneath the cartilage). However, a Repicci prosthesis is not suitable for treating extensive bone or cartilage damage in the knee. Due to the long life of 10–15 years, the Repicci prosthesis is particularly also used more and more in younger patients. This can save our patients from a complete knee replacement for several years or even prevent it entirely. 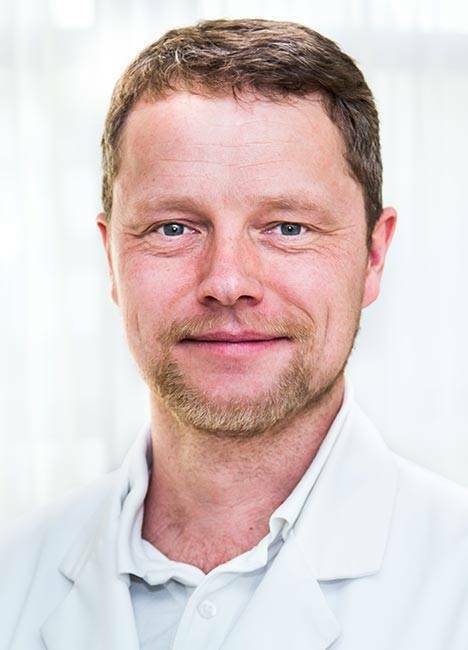 Here at Gelenk-Klinik we believe in the importance of a close relationship between the physicians and patients. You will be in the care of your attending physician from your first appointment until after the surgery. You have one point of contact who is completely familiar with your case. This physician will be assigned to you throughout your stay at Gelenk-Klinik. Our knee replacement experts are Dr Peter Baum, Professor Sven Ostermeier and PD Dr Bastian Marquaß. About 60% of all knee replacements performed at Gelenk-Klinik are joint-preserving partial knee replacements. This deep experience makes the Gelenk-Klinik a quality leader in this field. As a certified endoprosthesics centre (EndoProthetikZentrum (EPZ)) ] Gelenk-Klinik offers knee replacements of the highest standard. The certificate, which is reviewed annually, requires the physicians at Gelenk-Klinik to comply with the strictest professional obligations on patient counselling, diagnosis and documenting their surgeries. 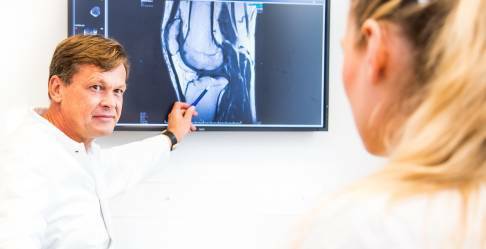 A passion for optimal orthopaedic care, investing in the latest diagnostic equipment and constantly applying modern orthopaedics has made EndoProthetikZentrum Gelenk-Klinik Gundelfingen one of the leading centres for joint-preserving orthopaedics and endoprosthetics in Baden-Württemberg. The success rate of the Repicci prosthesis particularly depends on the experience of the surgeon. A conclusive study has shown that only surgeons for whom at least 20% of their knee replacement operations are partial knee replacements can achieve good results. A rate of over 40% achieves the best surgical outcomes for partial knee replacements. At our Gelenk-Klinik orthopaedic joint centre, which aims at preserving the joint, this rate is actually 60%. More recent research findings show that over 50% of patients with osteoarthritis of the knee qualify for a partial replacement of the surface. The study examined 115 patients, each of whom had a full knee replacement and partial knee replacement to treat osteoarthritis of the knee. The mobility of the knee joint in patients with partial knee replacement was already significantly better on discharge from the hospital (77° compared to 67° with total knee prosthesis). Even 6 weeks after the surgery, mobility was still better with a partial knee replacement (115° compared to 110° with knee TEP). The shorter recovery time is another advantage of the joint-preserving Repicci prosthesis. The physician will first perform detailed medical diagnostics by examination and imaging to assess the condition of the respective knee in detail. The physician starts by reviewing your medical history: he will ask questions about your particular case and how the knee pain developed. He will then perform a medical examination and inspect the knee joint. Taking an X-ray whilst bearing weight shows the condition of the cartilage in the joint. The knee specialist can then use this image to make an initial assessment of the severity of the osteoarthritis of the knee. A magnetic resonance imaging scan (MRI) shows the condition of all soft tissue around the knee, the condition of the tendons and ligaments and the severity of cartilage wear. After determining the requirement for surgery, the attending physician will explain the procedure and possible complications of knee surgery. The patient will also meet with the anaesthesiologist, who will again assess in detail whether the patient meets all the health requirements for a safe anaesthesia. Once approved by the anaesthesiologist and the surgeon, the surgery can usually be performed the following day. Arthroscopy (minimally invasive) of the knee prior to the actual knee replacement ultimately decides whether a partial knee replacement or full knee replacement will be more suitable based on the particular osteoarthritis of the knee. This procedure examines whether the areas of the joint which will be preserved are in good condition. The arthroscopy is performed initially during the same procedure as the knee replacement. In some cases, arthroscopy can even rule out a knee replacement: if the cartilage damage shows that a restorative procedure such as a cartilage transplant is suitable, the surgeon will change the course of the surgery and will merely harvest a small amount of cartilage cells to grow in a laboratory. The American dentist and orthopaedist Dr Repicci applied the restorative techniques of dentistry to his surgical method with the goal of preserving as much of the knee as possible. Comparable with a dental insert, a metal or plastic inlay merely replaces the worn part of the joint. As a result, all the ligaments and all parts of the knee joint with good bone and cartilage are preserved. A partial knee replacement stops degenerative osteoarthritis of the knee from advancing. Compared to a full knee replacement, this surgical technique preserves over 80% of the body’s own (biological) structures of the knee joint. The partial knee replacement surgery typically takes about an hour and a half and is a minimally invasive procedure - only minimal skin incisions are necessary. This results in considerably less infections and complications. Once the Repicci prosthesis has been implanted there will only be minimal scarring, about 2–3 centimetres long. Artificial joints made from innovative, highly-compatible materials enable surprisingly short recovery times. Long-term studies have confirmed the excellent durability of modern knee prostheses. The precision with which an implant is positioned in the knee relative to the mechanical load of the particular knee joint determines how long it will last. There is therefore a direct link between quality of outcome andthe surgeon’s experience and amount of practice. Typically surgery of a Repicci prosthesis is performed under general anaesthesia. However, Gelenk-Klinik hospital can also perform the operation under spinal anaesthesia to reduce the risks of general anaesthesia. In this case the anaesthesiologist injects the anaesthetic into the vertebral canal of the lumbar spine. Here, the patient is conscious during surgery. You will decide about the best anaesthesia for you together with our anaesthetist. Our anaesthetisiologists are very experienced in both methods and choose the option best suited for you during a pre-operation discussion. Any procedure causes pain, but we always strive to minimise it. The anaesthetist will often use a so-called nerve block before the surgery, numbing the respective extremity for approximately 30 hours. 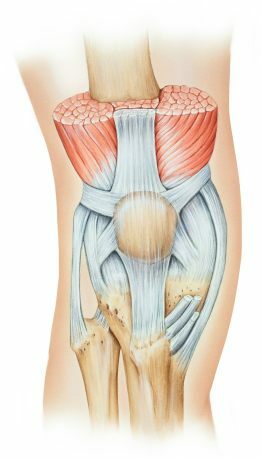 This step alone manages the majority of the pain, and any residual discomfort can then be easily treated with typical medication. Our goal is for you to experience as little pain as possible. What will my stay be like at Gelenk-Klinik? 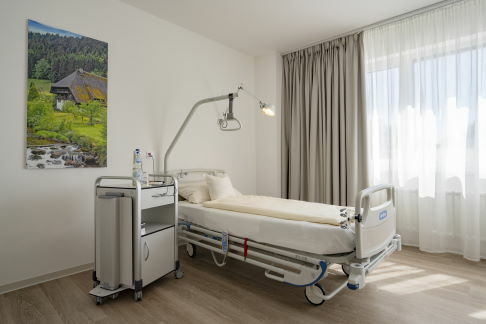 During your inpatient stay at Gelenk-Klinik you will have a single room. The room has a bathroom with shower and WC. All rooms include towels, a bathrobe and slippers. They further include a mini-bar and safe. All rooms also have a television and free WIFI. You only need to bring your personal medication, comfortable clothes and sleepwear. After surgery you will receive 24-hour care from experienced nursing staff and experienced physiotherapists. The inpatient stay following knee surgery is usually 5 days. There is a hotel within walking distance where your family members can stay. We are happy to make reservations for you. You should elevate and ice your knee immediately following surgery to minimise pain and swelling. You may get out of bed and place weight on the knee with the help of a physiotherapist from the first day after surgery. Your knee will be immobilised in a brace preventing the knee from flexing for 3 days. The stitches will be removed after about 14 days. Once these are removed, you can also shower again. We will provide you with crutches to ensure you can control the amount of weight initially placed on the knee. Thrombosis prophylaxis are imperative during the time you are unable to put your full weight on the leg. You will moreover receive physiotherapy to prevent muscle loss and restore mobility and the function of the knee as soon as possible. In addition to the cost of surgery you also need to plan for further costs for diagnosis, doctor’s appointments and temporary supports (e.g. crutches). These amount to between € 1500 and € 2000. If you plan to have the outpatient physiotherapy in Germany after surgery, we will gladly obtain an estimate of costs. You will find information about the cost of hotel accommodation and any follow-up treatment at the rehabilitation clinic on the websites of the respective providers. We require recent MRI scans and X-rays to be able to fully assess the cartilage damage in your knee. The diagnostic imaging allows us to determine quite accurately if you qualify for a Repicci prosthesis. However, the final assessment can only be made once you have been examined by a knee specialist at our clinic. We will gladly also advise you on alternative treatment options if your specific case does not qualify for a Repicci prosthesis. The specialists at the Gelenk-Klinik orthopaedic joint clinic are highly qualified in all knee surgeries for treating osteoarthritis of the knee. We firstly require recent MRI imaging and X-rays to be able to fully assess the condition of your knee. After sending these to us via our website, we will send you patient information including proposed treatment and a binding cost estimate within 1–2 business days. Gelenk-Klinik offers appointments for international patients to correspond with your preferred travel itinerary. We will gladly provide you with a medical visa invitation to help you apply for a visa once we have received the down-payment specified in the cost estimate. If you need to delay your travel we will promptly refund the full down-payment. We try to minimise the time between the preliminary examination and the surgery for our international patients to avoid additional travel. During your inpatient and outpatient stay our multi-lingual (English, Russian, Spanish, Portuguese) team will be there to assist you. We can also provide an interpreter (e.g. Arabic) at any time for a fee. We will gladly assist you with organising transportation and accommodation and provide recreational tips for your family members.